Dr. Nadu Tuakli is a board certified physician and specialist in Preventive Medicine and Family Practice. She has degrees from the University of Zambia, Harvard University, and has completed residencies at Johns Hopkins and the University of Michigan. 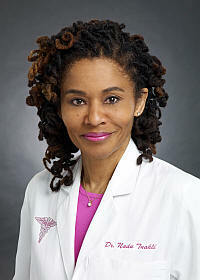 She is a Board Certified Physician who is a specialist in Preventive and Family Medicine. In addition, Dr. Tuakli is a Fellow of the American Academy of Family Physicians and a founding member of the Harvard Association of International Women. Dr. Tuakli gives seminars on Health and Anti-Aging topics every Spring and Fall. As a college professor she believes knowledge is power. Her seminars are eagerly anticipated and well attended because the scope is so broad and the information is practical. Dr. Tuakli helps her patients stay current with information they can use. Dr. Tuakli has been a guest on various television and radio shows. She was part of a Discovery Health Channel series on anti-aging and has been a featured guest on radio stations in the Baltimore-Washington area (WBAL, WHUR, and 88.9FM). Dr. Tuakli hosted her own talk show “Your Health” on WVIE 1370AM Baltimore. Dr. Tuakli is an Assistant Clinical Professor at Georgetown Medical School. She has also taught medical students from Johns Hopkins University and nurse practitioners from the University of Maryland. Dr. Tuakli regularly provides volunteer medical services in less fortunate countries including, Jamaica, the Dominican Republic, Haiti, and Honduras. Dr. Tuakli has been in private practice for over 20 years. She takes care of patients of all ages with a myriad of conditions. She has treated hundreds of people with Menopause, Andropause, Erectile Dysfunction and other hormone deficiency states with Bio-Identical Hormones as well as other Anti-Aging therapies. I am proud to offer the highest standard of individualized patient-centered programs that maintain health and reverse many of the effects of aging. My goal is for patients to become their own best health advocates through a process of education, one-on-one consultations, and results-oriented wellness strategies. I am very pleased to report that my practice has transformed the lives of hundreds of people who now lead vibrant, active lives free from many of the symptoms that had plagued them. I encourage you to take that first step toward regaining your optimal energy and vitality. Make a commitment to be your best by investing time, energy, and resources into your health. This means that you do not have to accept symptoms like weight-gain, bad skin, sleep problems and low libido as inevitable. I use traditional, natural and holistic methods to increase the wellness of the whole family.